The unusual metallic turquoise flowers are expected to last for around two weeks but it will sadly be the first and last time the plant blooms as they die shortly after the flowers fade. Puya berteroniana is now considered to be a hybrid and the plants occasionally found in cultivation (such as the one above) should be more properly regarded as Puya alpestris subsp. zoellneri. Origin and Habitat: Mountain ranges of Chile. Altitude range: 500–2000 metres above sea level. Habitat and ecology: They are native to the Andes in South America where conditions are very arid and the leaves are covered in a waxy substance to protect them. Established on north-facing rocky exposures, Puya berteroniana–Adesmia arborea communities are the habitat of Trichocereus chiloensis. This species is is the host of the Chagual butterfly (Castnia psittachus Mol.) The largest Chilean butterfly, the larva is fed through the interior of the stems of rosettes, floral scape, etc.. It also hosts of some species of native bees. The spines of the outer two thirds of the leaf are oriented towards the apex (outside of the rosette), so that the herbivores hardly reach the centre where the core is edible. Blooms in spring (from September to November). It will be in flower for a couple of weeks and then hundreds of the seeds will be pollinated by birds, and (only one or two of those will survive. 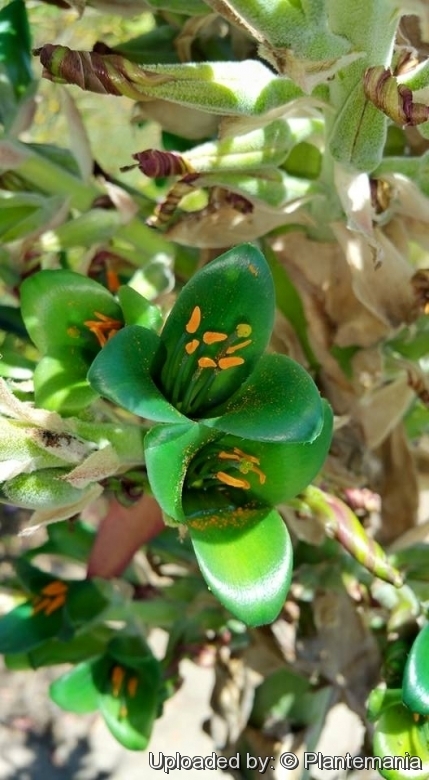 Description: Puya x berteroniana has a basal rosette of stiff, spiny silvery leaves, from the centre of which a develops a huge asparagus-like flower stalk, bearing hundreds of very unusual metallic, turquoise-blue or blue-black flowers with spectacular orange stamens. It can grow up to 2(-3) metres tall and may last for 100 years before it flowers (usually 6-10). The Puya berteroniana is a monocarpic plant which means it flowers just once and then dies shortly after the flowers fade. Taxonomy: There is a lot of confusion about the classification of this species. A re-evaluation of the widely applied concept of P. berteroniana led to the conclusion that the type of P. berteroniana is of hybrid origin and is maintained as Puya x berteroniana (Georg Zizka et al. 2013). 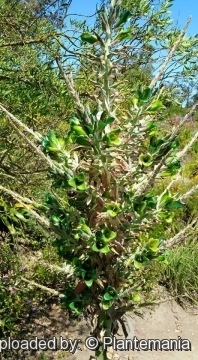 The name P. berteroniana has been widely misapplied to what in fact is the northern, larger form of the blue flowering Puya alpestris, which is regarded as a new subspecies, Puya alpestris subsp. zoellneri, a member of subgenus Puya. Puya x berteroniana is a very rare and almost unknown hybrid. Habit, leaves, and inﬂorescence: unknown. Partial inﬂorescences: basally for 1.6–3.2 cm sterile, broadly triangular in outline, 19–28 cm long; rachis densely covered with stellate trichomes, ﬂowers more or less dense, fertile throughout, bracts reduced in size towards apex; primary bracts ovate, 8.5–12.5 long, 3.5 cm wide, brown, lepidote, membranous, nerved, serrate. Floral bracts elliptical to rarely ovate, acute to acuminate, 2–5 cm long, 0.7–1.4 cm wide, exceeding the sepals, reddish below, lepidote, somewhat membranous, nerved, entire. Pedicel 5–12 mm long, 1.5–2.5 mm wide. Flowers: 2.7–5.2 cm long. Sepals rounded and rarely mucronate to acuminate, 1.8–4×0.4–0.6 cm, coriaceous, prominently nerved, entire; petals 4.5 cm long. Filaments 3 cm long, pollen yellow. Ovary 6×3 mm. Fruit and seeds: Not known. Notes: Puya berteroniana presents a strange and extraordinary phenomenon of auto-combustion, which also appears in Puya chilensis, Puya venusta and Puya coerulea, this phenomenon affects older individuals. Zöllner reported to have seen a spontaneous combustion in an individual on Cerro la Campana, on the afternoon of a hot day. 1) Zizka, G., Schneider, J.V., Schulte, K. & Novoa, P. “Taxonomic revision of the Chilean Puya species (Puyoideae, Bromeliaceae), with special notes on the Puya alpestris-Puya berteroniana species complex.” Brittonia 65: 387-407. (2013). 3) Albano, P.-O. “La Conaissance des Plantes Exotiques”: 1-324. Édisud, Aix-en-Provence. (2003). 4) Govaerts, R. “World Checklist of Monocotyledons” Database in ACCESS: 1-54382. The Board of Trustees of the Royal Botanic Gardens, Kew. (2004). 9) ZÖELLNER O & NILO M “El género Puya en la V región. Revista geográfica de Valparaíso”. Nº 19:29-38, 1988. Cultivation and Propagation: Puya x berteroniana is a compact and carefree slow growing bromeliad not particularly ornamental most of the year, but exceedingly handsome when in full flower. Traditional uses: The Chileans like to eat the stalk when it first appears, it resembles a big fat asparagus spear which is sliced and used raw in salads much as palm hearts are eaten. Puya x berteroniana is sometimes cultivated as an ornamental or stove plant in other countries. The soft stem material has been used for corks and bungs and the leaf spines as fish hooks. Fibers from the leaves are used to weave durable fishing-nets. The extract from the long stalk of the inflorescence is used for setting fractures. Nectar of the flowers is applied to an aching ear. Propagation: Puya x berteroniana is propagated by division of offsets and from seed. The offsets can be detached and repotted when they have reached the dimension of one third of the mother plant. Be sure to provide high humidity for a month after propagating the offsets. Fresh seed germinates in as little as 14 days from sowing. Remove seeds from inﬂorescence and lay them uncovered on a bed of of pumice grit; keep constantly but moderately moist. Starting from the seed, 6-10 (or more) years are needed for the blossoming, whilst at least 4 years are needed by division.